When upgrading to a heavier duty pressure plate in any vehicle, the pedal from the factory is not set for enough travel. This page will provide you with the information you and/or your mechanic needs to know when properly installing a high performance clutch. If you are experiencing a new clutch slipping or if the pedal height changes as the clutch heats up, then the free play has been removed. The following will allow you to properly adjust the pedal. Almost all clutch manufacturers check the travel needed to release a factory clutch and manufacture their clutches to have the same travel for full release. The problem is that with a much higher clamp load pressure plate the clutch hydraulic system can not release the same amount and requires more pedal travel to move the pressure plate fingers the same amount. The clutch release system is fully hydraulic. In order for the system to work properly. The system needs to have a minimum of 16th of an inch of free play. Without the proper free play, the fluid cannot return to the master cylinder. When this occurs the fluid expands as it heats up and causes the clutch to release and not fully engage and this is why you feel the pedal engaging higher as it warms up. 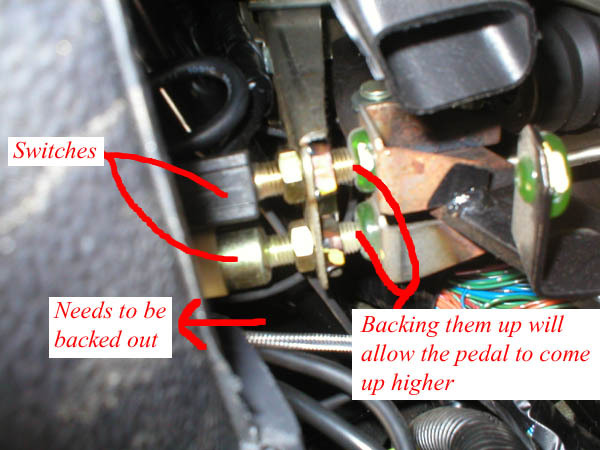 If you follow these instruction provided, you will be insured in having a perfect pedal adjustment. 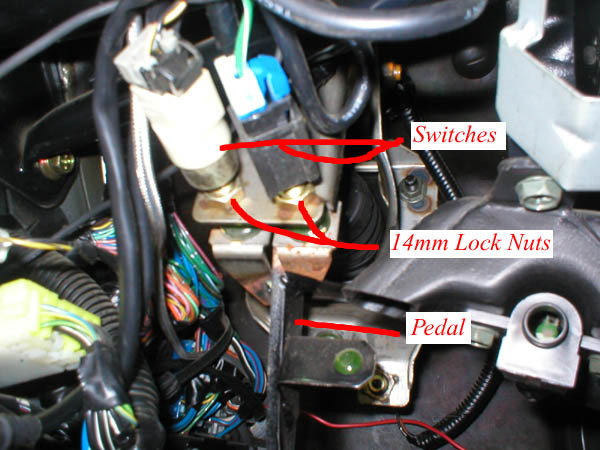 To get to the pedal adjustments one can get underneath the dash and locate the clutch pedal assembly. There are 2 main areas of adjustment. 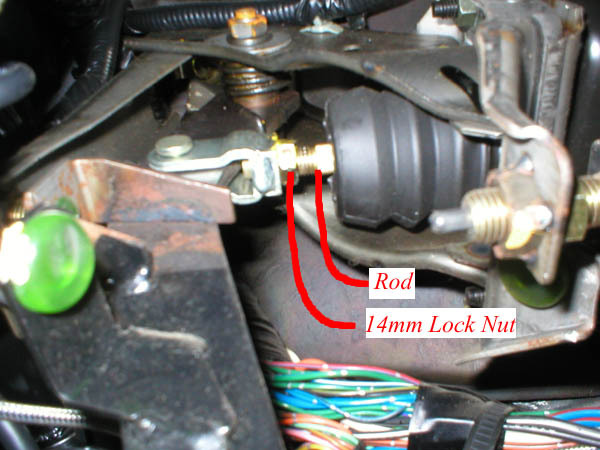 The rod, which in turn is what applies pressure against the clutch master. Then there are 2 switches which the pedal rests on when not pushed in. When the rod has been adjusted (the rod is turned further into the master) the pedal is moved further up, but the further the rod is moved the more pressure the pedal makes against the switches. If you adjust only the rod you will definitely have problems. 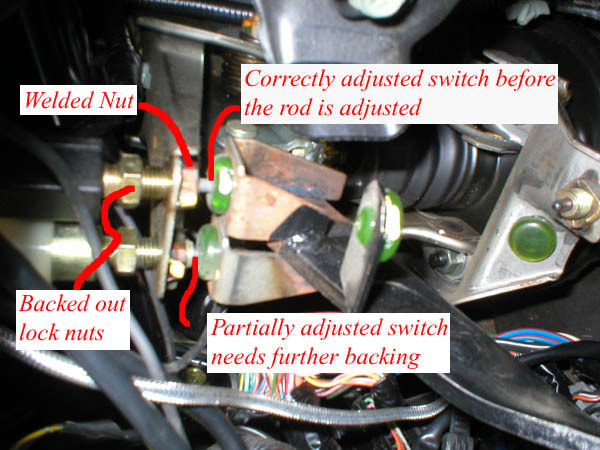 By adjusting only the rod to the master you are removing the free play needed to fully engage the clutch. So the switches need to be backed out to allow the pedal to come up further for more travel and then the free play can be readjusted. Only by adjusting both areas can the free play be retained while adding extra travel to the pedal assembly to achieve a good release. You will see that the rod and switches are locked in place with their very own 14mm lock nut. 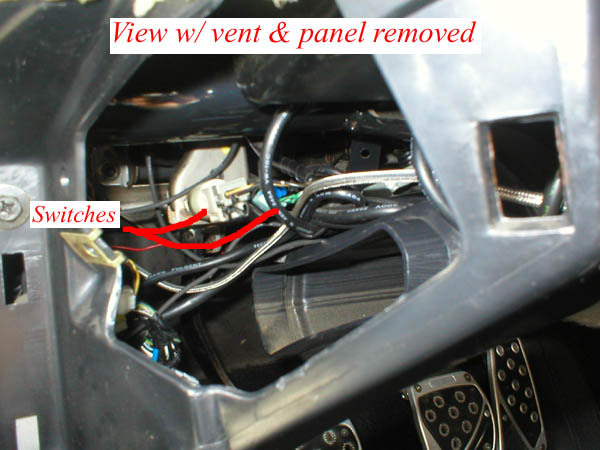 These nuts need to be loosened and then the adjustments can be made. The place to always start to insure the proper adjustment is the switches. If you adjust the rod first it is extremely hard to tell if you have proper free play. Disconnecting the electrical plugs from the switches will make backing them up easier. Once the 14mm lock nuts are loosened one can use their hand to back the switches out. Again, backing the switches out will let the pedal raise up higher allowing more pedal travel causing the clutch to release more. To achieve maximum adjustment the threaded part of the switch needs to be level with the welded nut on the bracket they are mounted to. You can now see that the switches are no longer holding the pedal down. Once the switches are level with the welded nuts you can tighten the 14mm lock nuts that lock the switches. Now you can adjust the rod so that the switches close, and that will raise the pedal up. You want the grey pins to close, but no pressure on the pedal. So as you adjust the rod the green pads will slowly come towards the welded nut until it just barely touches the welded nuts and fully closing the pins on the switches. Again do not go any farther then it takes to fully close the pins on the switches. To adjust the rod, use needle nose pliers and turn the rod towards the master or firewall (away from the driver). The pedal will slowly come up with every turn of the rod. Watch carefully and only adjust the rod so that the pins just barely close on the switches . If you follow this procedure exactly, you will end up with a perfect adjustment. Don’t forget to tighten all the 14mm lock nuts (3) when finished.